Traditional wooden shaft with drop forged head Approx. Traditional wooden shaft with drop forged head. Stubby Design With Magnetic Head For Starting Nails Easily. Comfortable Soft Grip Handle. Fibreglass 16oz (0.45kg) Heavy Duty Rubber Mallet. - 16oz Rubber Mallet Fibreglass Handle for Shock Absorption. - Ergonomic Anti Slip Grip. - Anti Slip Fibreglass Handle. - Durable Rubber Head. Free Pair of Work Gloves -. Fibreglass shaft and rubber grip. Drop forged, heat treated head. Fibreglass shaft fitted with rubber grip. Hardened white rubber striking face. Stubby design with magnetic, heat treated head for starting nails easily. Comfortable soft grip handle. Fibreglass shaft with rubber grip. Drop forged, hardened and tempered polished head. floor cleaners. If you require any item in bulk then get in touch for a quote, our trade prices are very competitive! AMTECH 16oz RUBBER MALLET STRONG FIBERGLASS SHAFT A1580. Fibreglass handle with rubber grip. tile cleaners. Soft and comfortable, non-slip rubber grip. Hardened black rubber striking face. copper fittings. Am-Tech 4.5"(113mm) Beech Wood Mallet. Approx size: 4-1/2" (113mm). Solid head with angled striking faces. EAN 5032759011926. MPN Does Not Apply. EAN Does not apply. MPN Does Not Apply. Fibreglass shaft. Forged carbon steel head. EAN 5032759011933. MPN Does Not Apply. Ideal for jewellery making, hobby and craft use. Fibreglass shaft with rubber grip. MPN Does Not Apply. Due slot per cintura. Drop forged steel mallet head material. Heat treated head with fibreglass shaft. Heads are securely fixed to fibreglass handle with nylon jacket. Drop forged, hardened and tempered fully polished head with wooden handle. Hardened and tempered polished head. Amtech have a fantastic range of essential tools. Fibreglass Shaft With Rubber Grip. Drop Forged, Hardened And Tempered Polished Head. ABOUT AMTECH TOOLS Is there anything more satisfying than a job well done?. Not to us at Amtech Tools. Whether it’s a small fix or a big fix up, we love it when things are done right. It’s why we’ve been helping people do it themselves for more than 30 years. Multi-head craft hammer Includes 6 interchangeable heads Ideal for jewellery making, hobby and craft use Lightweight for ease of use . Fibreglass handle with rubber grip. Hardened black rubber striking face. Car Care & Accessories. Drop forged, heat treated head with fibreglass shaft Comfortable rubber grip Heads are securely fixed to fibreglass handle with nylon jacket General purpose sledge hammers ideal for building and demolition work Am-Tech branded . Fibreglass shaft with rubber grip. Drop forged, hardened and tempered polished head. Car Care & Accessories. Ideal for a variety of brickwork, blockwork, masonry and landscaping tasks. Fibreglass shaft. Hardened chisel edge tip designed to score materials before striking for an even cut. Drop forged, hardened and tempered polished head Fibreglass handle Rubber grip on handle Am-Tech branded Ideal gift . Fibreglass shaft with rubber grip. Drop forged, hardened and tempered polished head. Fibreglass shaft with rubber grip. Drop forged, heat treated head with chamfered edges. Car Care & Accessories. Shot filled head dampens rebound. Trailer Parts & Accessories. Non-marking head. Car Care & Accessories. 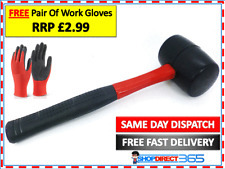 Ideal for assembly work. Hickory shaft. Drop forged, heat treated head with chamfered edges. For use with cold chisels and brick bolsters. Car Care & Accessories. Trailer Parts & Accessories. Solid head with angled striking faces. Car Care & Accessories. Approx size: 4-1/2" (113mm). Capacity 45kgs. Foldable, compact design for easy storage and transportation. Durable aluminium construction with sturdy wheels. Trailer Parts & Accessories. Toe plate and wheels open and close simultaneously. Ball Pein Hammer Fibreglass shaft with rubber grip Drop forged, heat treated head Ideal for striking, punching, riveting, shaping and straightening unhardened metal 32oz . Traditional wooden shaft with drop forged head.